According to a news release culled from the tech media site, IPhoneInCanada.Ca, the film director responsible for the now-obsolete Apple Genius ads, Scott Trattner, has resigned. And, it gets even juicer and more intriguing. In the wake of his resignation, he hopped on over to advertising company 72andSunny to work for the Discovery Channel, Hewlett-Packard, Nike, and Samsung. Yes, you read that correctly – Apple frenemy – Samsung. Is that why the ads were pulled off the television and Internet? It’s like a “cart and horse” thing here. Did Scott Trattner leave Apple because of the poorly received Genius Ads or did Apple yank them off the air in the wake of his new job offer from 72andSunny? I know the ads received lukewarm reviews and all that (well, not from me), but it seemed like such a radical move on the part of Apple to succumb to media pressure. One would think that the richest company in history would have more confidence in their abilities and innovative vision. Who has answers or theories out there? I am in a conspiracy theory kind of mood. Humor me! In the meantime, where is that Apple Tech Toy? [Satire Alert] Samsung Opens An Apple Store. Samsung just opened its first North American retail store in Canada in Burnaby’s Metropolis in Metrotown mall in suburban Vancouver. So, high-five to them and all that! But, honestly, after reading this article from IDownLoadBlog.Com, they must have overdosed their architect with mucho cojones or something because it is pretty much an exact replica of the famed Apple Store, right down to the blue shirts for their employees. Can you believe it? 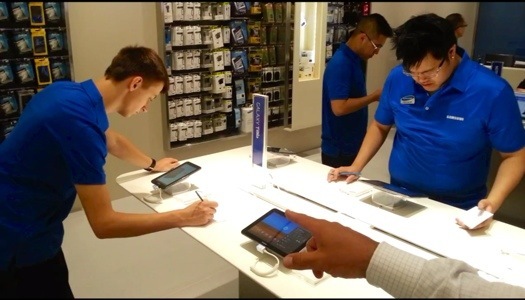 They have the audacity to uniform their staff with blue shirts? Hello? Last time I looked there were many colors in the rainbow so why select the famed Apple blue? Boy, they are really sticking it to Apple, aren’t they? It just never ends. I know that oftentimes “imitation is the sincerest form of flattery”, but this is just too, too much. Samsung must really love the publicity they are gaining from lawsuits filed by Apple Inc. because nothing else makes sense here. Check out the video below. Really mind-blowing when it comes to their thought process when designing this store. And the store is pretty depleted when it comes to customers. Compare this Samsung opening event to Apple’s Grand Opening in the same mall a little over a year ago. Beyond hilarious!